Hungary warns over travel restrictions Jump to media player A convoy of cars driven by German and Austrian activists has crossed into Hungary to pick up migrants and help them reach Western Europe. 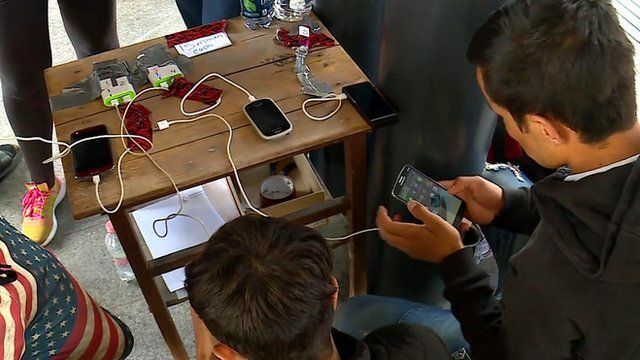 Inside Budapest's Keleti station Jump to media player The BBC's Ben Brown reports from inside Budapest's Keleti station were migrants are staying in the hope of taking trains from Hungary to other parts of Europe. Drone films migrant walk from Budapest Jump to media player Drone footage filmed on Friday and Saturday shows the number of migrants prepared to walk to the Austrian border. Large numbers of refugees and migrants have been passing through Keleti train station in Budapest in Hungary on their way to north and western Europe. In addition to food and water, another essential is being provided at the station - somewhere for people in transit to charge their mobile phones. As the BBC's Gavin Lee has been finding out, the phone can be an important lifeline in the long journey to other countries.